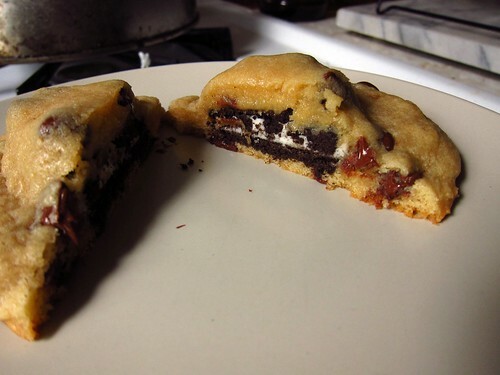 You might have heard about the recipe Picky Palate came up with a few months back that involves baking an Oreo inside a chocolate chip cookie? I did, and so did Kansas. And he REALLY wanted to make them during his visit here, but we encountered a few problems. The dough was too dry and crumbly, the Newman Os-Oreos taste too chemically to me lately-kept getting squashed and losing their filling, the whole experiment didn't turn out good and I gave up. Then a friend of mine said that she too had problems making them. So I went back over the recipe and tried again. I knew I had to cut the flour content the original recipe calls for (three and a half cups), but by how much? I didn't want it to be so much that the butter would win out in the oven and cause cookie spreading. After a few calculations, I felt confident to just cut it back by a half cup, and leave the butter at eight ounces. 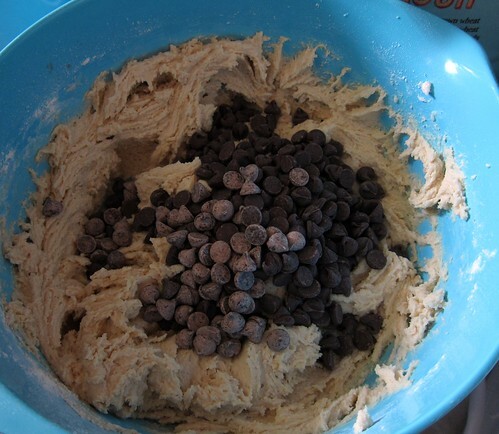 I also cut a few of the chocolate chips out of the equation. 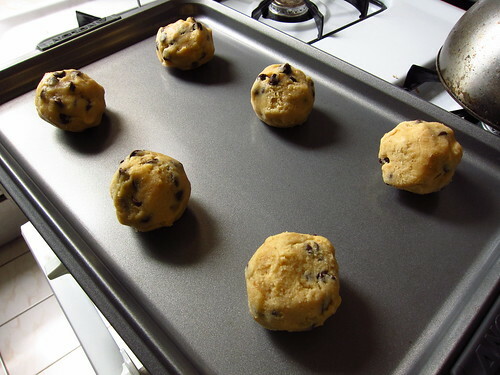 I found that the best way to form dough balls-the batch where they literally looked like chocolate chip tennis balls came out better-was to use frozen cookies and pliable lukewarm dough. If you're one to place your dough in the fridge, you'll need to warm it up first. 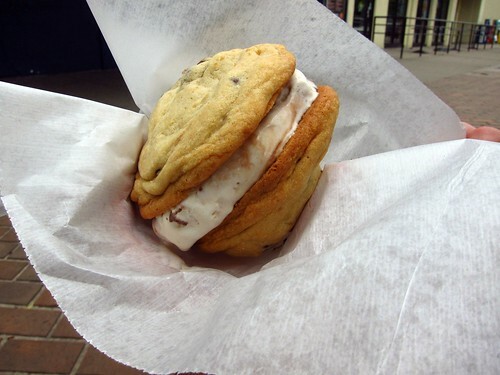 I would make dough patties about size of my inner palm, place the cookie in between, and seal it all together. And voilà! This was from the first batch, I was still perfecting the dough and cooking time, but damn was this a good triple cookie. I think I ended up leaving the second batch in for almost 15 minutes. I focused more on the golden top with a crispy bottom look than on the clock, so don't quote me on that. 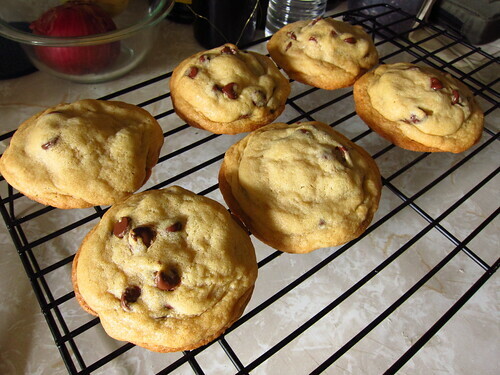 Here's the second batch, it was a bit more promising and enjoyable. 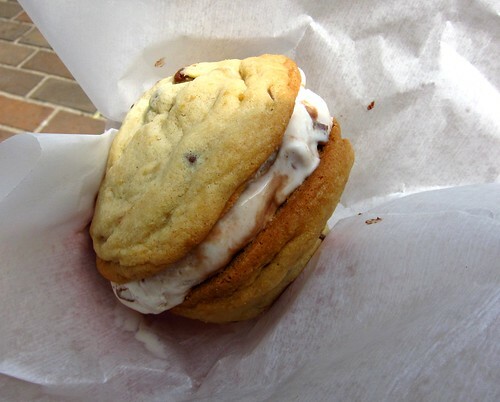 Once I surprised Kansas with the batch, his second response was "SYLAS & MADDY'S ICE CREAM SANDWICH!" Of course, I couldn't say no to that. We may have to do this again for my birthday celebration, but we'll have to make sure to get a bowl. My two favorite cookies in one! That looks so good this morning. I would love to sink my teeth into it. How have I not heard of these?!? I must try them. wow i've never heard of these but that sounds incredible! thanks for perfecting this recipe can't wait to try it!